South Bend, Indiana Mayor and 2020 presidential candidate Pete Buttigieg won the attention of progressives on social media on Tuesday night after indicating support for packing the U.S. Supreme Court with left-leaning judges in order to push through progressive proposals which have the support of most Americans. I like Buttigieg. And for the Identity Politics litmus test crowd, he’s gay and young. Then again, he’s white. Well, you can’t please everyone. After packing the courts, let’s pass a law giving term limits to these Supreme Court Justices. We have to keep in mind too that we need to keep at bay the reactionaries of both major parties and that they could “pack the courts” in their favor too should they regain or hold onto power. This was a nice surprise for me as I had not heard of him. Pete Buttigieg, the 37-year-old Democratic mayor of South Bend, Indiana, on why he’s building a presidential run on what he calls "intergenerational justice." I like the term “pack the courts”. Low amount of syllables, catchy and has strong sounding letters. I 100% agree that while packing the courts is a drastic step, it’s become necessary in order to remediate completely disingenuous abuse of the Senate’s power. Republicans in 2005: “The Senate’s job is to hear AND confirm the President’s appointments” as if confirmation was a binding obligation. They care nothing for rule of law, and if they don’t like the measures necessary to right what they’ve broken, tough. This is somewhat dangerous talk. Let us hope that Trump is not listening. Right now, Trump could expand the number of Supreme Court justices to 11 or 13 members, all of whom would be Kavanaugh clones, and the current Senate would cheerfully go along with him. The Democrats would do absolutely nothing about it. Then Trump would definitely have a bulletproof majority for all decisions. I saw him on late night TV the other night and was impressed. Intelligent and thoughtful. Where was everyone when I suggested this a week or two ago? I don’t recall any pro or con comments. Now that the suggestion is MAIN stream, I would like to see a time served limitation. Mainly because we live in a corrupted society. Thus, judges can be bought easier with more time to do it. I am sending this around. I’ve just proven to myself that folks hear what they want to hear. Me…I did it. I heard him on BUR, Skeptic, and was blown away. And I still think he makes his sound points real well. But then I get to sleep late tomorrow, so I go back for things I’ve missed (have the time tonight). Now, if I’ve gotten who said what wrong, somebody please correct me. Two emergent heroes in the past week have demonstrated they don’t, after all, have things in focus?? That didn’t take long. Iran has a bit of a clampdown going on, true, but they’re not using the world’s largest outdoor prison for target practice (where does Ilhan Omar get off comparing Israel to Iran?). And Buttigieg is shifty. Of course he’s right to say Israel’s out to lunch for worrying about Iran (ISMW), but at the same time he’s saying Israel’s not as bad as Iran??? Omar’s right about Abrams, but wrong on Iran. 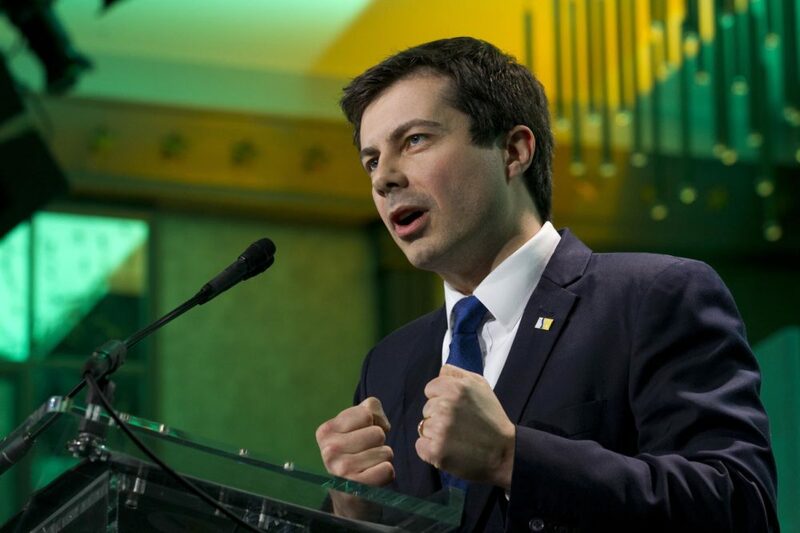 Buttigieg’s probably right about Iran, but wrong about Israel. Talk about whirlwind progressives slip’n and slide’n on half their stuff…in no time flat!!! Have I even got the right people here saying what they actually said? It’s hard to believe it. Is stirring everything with a stick part of this operation-divide-the-left, or what? Tried and true (Sanders & Gabbard) must be best…as they don’t take the risk of talk’n out their hats?? I agree, term limits on these Justices must be a no-brainer. There is no reason they deserve to hold an office any longer than any other public servant. overturn Roe why wouldn’t there be a parallel response from the Dems? on the SC along with Thomas, the first. in front of the whole country, the whole world." These aren’t contests between Dems and Repugs, these are Dems colluding with Repugs. No competing party could be that lame. Hate to tempt fate here, but Ginsburg is shaky in the longevity department. And that’s probably why they got rid of Scalia. And I don’t see a lot of liberal strength coming from Elena or Sonia. He’s right on the courts. But I’m still hoping…as per my comment above…that I’ve gotten folks mixed up re who said what. What a let down this Israel/Iran comparison thing. With respect to both of’em. Pinning a politician down is pretty much impossible. My viewpoint on Buttigeig is that if the d-party wanted to polish up its messaging, they could do worse than to highlight him. Also, I view the Democrats as a failed party. They’re merely a counterweight to the party that has effectively exerted control over the political agenda for several decades. If the Ds are a divided party, it’s because they’re all over the map in terms of policy, and ask liberals like me to compromise with the likes of Joes Manchin, Biden, and Lieberman. No thanks. I no longer vote for Dems. Instead of term limits the criteria for justices should be a long and honorable career with the SCOTUS as a reward for such service. The deal of late is for Republicans and “conservatives” especially, to nominate young snot-nose punks like Kavanaugh, who will dominate the court and our nations direction for 40 years give or take - nominated to defend the oligarchy and vulture capitalism, when the criteria for a seat on the court should be greater turnover by nominating people of wisdom in their senior years as that reward for a lifetime of honorable service, integrity. and moral compass. And I will add easier impeachment for corruption and/or standards at odds with integrity like uncle Thomas, Alito, Gorsuch, and of course the serial perjurer and attacker of women, Kavanaugh. FDR had problems and threatened to “pack the court” as the Constitution does not specify the number only an odd number! Don’t play nice with the right-wing, you use power as and when you can…if only the DINO sellouts had any desire to and/or the Moxie!